Erich von Falkenhayn (11 September 1861 - 8 April 1922) was a German soldier and Chief of the General Staff during World War I. He became a military writer after World War I. Born in Burg Belchau near Graudenz in the Province of Prussia, Falkenhayn became a career soldier. Between 1896 and 1903 he served in Qing China, and saw action during the Boxer Rebellion. Afterwards, the Army posted him to Brunswick, Metz, and Magdeburg, with ever-increasing rank. In 1913, he became Prussian Minister of War, in which capacity he acted as one of the key players in the genesis of World War I when the assassination of Archduke Franz Ferdinand in Sarajevo took place. 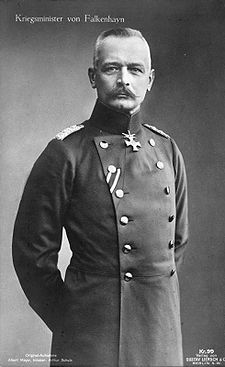 Like most German military, he did not then count on an overall war, but he very soon embraced the idea and belonged to those pushing Kaiser Wilhelm II to declare war. Falkenhayn succeeded Moltke as Chief of the General Staff of the German Army after the Battle of the Marne on 14 September 1914. Confronted with the failure of the Schlieffen Plan due to Moltke's interference, he attempted to outflank the British and French in the "Race to the Sea", a series of engagements throughout northern France and Belgium in which each side tried to turn the other's flank until they reached the coastline. The British and French eventually stopped the Germans at the First Battle of Ypres (October-November 1914). Falkenhayn preferred an offensive strategy on the Western Front while conducting a limited campaign in the east: he hoped that Russia would accept a separate armistice more easily if it had not been humiliated too much. This brought him into conflict with Hindenburg and Ludendorff, who favored massive offensives in the east. Eventually - either in the hope that a massive slaughter would lead Europe's political leaders to consider ending the war, or that losses would in the end be less harmful for Germany than for France - Falkenhayn staged a massive battle of attrition, as claimed in his post-war memoires, at Verdun in early 1916. Although more than a quarter of a million soldiers eventually died - for which Falkenhayn was sometimes called "the Blood-Miller of Verdun" - neither side's resolve was lessened, because, contrary to Falkenhayn's assumptions, the Entente was able to replace their dead with fresh "human material" via the Noria system. After the failure at Verdun, coupled with several reverses in the east and incessant lobbying by Hindenburg and Ludendorff, Falkenhayn was replaced as Chief of Staff by Hindenburg. Falkenhayn then assumed command of the Ninth Army in Transylvania, and in August launched a joint offensive against Romania with von Mackensen. Falkenhayn's forces captured the Romanian capital of Bucharest in less than four months. Following this success, Falkenhayn went to take military command in then-Turkish Palestine, where he eventually failed to prevent the British under General Edmund Allenby from conquering Jerusalem in December 1917. In February 1918, Falkenhayn became commander of the Tenth Army in Belarus, in which capacity he witnessed the end of the war. In 1919, he retired from the Army and withdrew to his estate, where he wrote several books on war, strategy, and his autobiography. He died at Schloss Lindstedt near Potsdam. Falkenhayn in many ways typified the Prussian generals; a militarist in the literal sense, he had undeniable political and military competence but showed contempt toward democracy and the representative Reichstag. In a book on Falkenhayn's strategy, Foley (2005) argues that the Allies, who had larger resources, copied and successfully used Falkenhayn's "blood-mill" approach; in that sense his method would, indirectly, have led to Germany losing World War I.
Militarily, Falkenhayn had a mixed record. His offensive at Verdun proved a strategic failure, although Allied casualties were significantly higher than that of the Germans. His defence of Palestine in 1917 was also a failure - though it must be admitted that his forces (which belonged to the Ottomans) were both outnumbered and out-classed; casualties were fairly equal in number, as well. On the other hand, his planning and subsequent conquest of Romania was a near perfect example of how to conduct an offensive against superior forces, considering additionally that he had little hand in planning the war effort. Winston Churchill considered him to be the ablest by far of the German generals in World War I. Dupuy also ranks him near the top of the German commanders, just below Paul von Hindenburg and Erich Ludendorff (The Encyclopedia of Military History, p.915). Holger Afflerbach: Falkenhayn. Politisches Denken und Handeln im Kaiserreich (Mx�nchen: Oldenbourg, 1994). The standard modern biography. Robert Foley: German Strategy and the Path to Verdun: Erich von Falkenhayn and the Development of Attrition, 1870-1916 (Cambridge: Cambridge University Press, 2005). Explores Falkenhayn's strategy in the First World War.